Lock in a great price for Art Hotel Pelican Bay – rated 9.1 by recent guests! Exceptional Hotel, I am well travelled and this Hotel offered everything we wanted. Beautifully Furnished, very clean, genuinely pleasant staff. A great breakfast offering a wide choice of food I would delintely return to this Hotel. Everything was amazing! The staff was helpful and friendly! They told us the best places to go around the area and island. They arranged an ATV for us to travel around with the best company! Excellent stay! We will definitely be back! The staff were very friendly and helpful. Room was clean and tidy, and the view from the balcony was great. Pool was quiet most of the time which made it enjoyable to be around, however could do with some additional sunbeds for busier periods. Very well located, only a 5min walk from the beach, and plenty of small shops within walking distance for food/drink. Beautiful pool area, never crowded and lots of interesting people. Really comfortable stay in convenient location with incredibly polite and friendly staff . Awesome hotel, we were in a high level superior room with amazing views. The room was clean, spacious and well furnished and well equipped. The staff were extremely helpful and friendly. Breakfast was varied and tasty. Location was perfect for the beaches, with a bus only a 5 minute walk away to take us to Mykonos town. Sophia? (Sofia?) was absolutely lovely and catered for all of our needs and provided us with lots of recommendations. Aircon in room was perfect & views of beach from room were great. Art Hotel Pelican Bay This rating is a reflection of how the property compares to the industry standard when it comes to price, facilities and services available. It's based on a self-evaluation by the property. Use this rating to help choose your stay! Inspired by the beauty of the Cyclades’ landscape, Art Hotel Pelican Bay offers elegant accommodations with an outdoor pool. Free Wi-Fi is offered. Pelican Bay is located in Platis Yialos, only 1,000 feet from the famous beach and public bus stop, 2.5 mi away from the airport and the center of the town of Mykonos and port. When would you like to stay at Art Hotel Pelican Bay? Features LCD TV with satellite channels, air conditioning, free Wi-Fi, fridge and balcony or terrace with side sea views. Features a sitting area, spacious bathroom with toiletries, LCD TV with satellite channels, air conditioning, free Wi-Fi, fridge and balcony or terrace with sea views. Please note that a 3rd guest sleeps in a sofa bed. Pelican Bay Art Hotel is a small Greek ancient art hotel of 40 rooms. Our target is to offer Greek Hospitality and not only accommodation. We wish our guests to have a memorable vacation so we are trying to be updated with " what's going on in the island" and offer a total service - information. Our guests are always welcome and we see them more as our friends.!!! House Rules Art Hotel Pelican Bay takes special requests – add in the next step! One child from 4 to 12 years is charged EUR 30 per stay when using existing beds. Art Hotel Pelican Bay accepts these cards and reserves the right to temporarily hold an amount prior to arrival. Breakfast could have been slightly better, most of the food was lukewarm. Provide transfers to the main town like some of the other hotels in the area. Ironing board was barely usable. We had to shift rooms during our stay. Was quite expensive for the size of the room. The steps in the pool are in a deeper part and should be in the shallow end. Ideally 2 lots of steps would be more beneficial. Had to cancel due to family. Hotel wouldn't refund us. Pretty disappointed about the lack of compassion. Nice rooms. Excellent breakfast included. Great value for the money. Nice bar area and restaurant. The beds were to die for, the room was cleaned and towels replaced every time they were used and every time you left your room. Service was great. Rooms had incredible views, beach is only 450m away. I will definitely go back! George, the bartender is fantastic! Definitely the highlight of the hotel. Answers all questions you may have and is a great conversationalist. The hotel itself is lovely, very modern & the pool is clean, perfect temp. Easy enough to get the bus into Mykonos town/other beaches or you can walk down to the beaches in front of the hotel. To utilize the Sauna you have to pay 20 euros, which seems a bit much since guests are already paying to stay at the hotel and the Sauna is very basic. Should be included. The property is beautiful with great views of the sea. The terrace was breezy as the bed was super comfortable. The washrooms were clean and the room was cleaned every day. The location is great with the beach 5 min away walking and plenty of great restaurants. Absolutely loved our stay here. 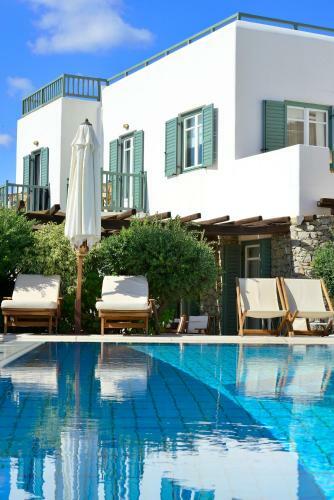 Nice location, close to the Mykonos town and close to Platis Gialos and Psarou beaches. Great transport service from the port to the hotel. Superior room was big, clean and had a very nice balcony with views over the area and the sea. The room service and the reception were very responsive, quick and polite.